This is the second retail shop for CheeseQuakes!, following a two-year-old store at the San Francisco Ferry Building. Rizos says his desserts are better than your average cheesecake because of the high-quality ingredients used. The crusts are made with a combination of graham cracker and chocolate cookie crumbs and butter, while the fillings are made with rBST hormone-free dairy and locally sourced products like Inna Jam, Maison de Monaco jams and Guittard chocolate. He also says that unlike traditional New York cheesecakes, CheeseQuakes! have a softer, creamier filling that are lighter on sugar. Along with familiar cheesecake flavors, some standout CheeseQuake! offerings include Candycap Mushroom, a maple-like flavor made with San Francisco’s Far West Fungi mushrooms, Old Rasputin made with North Coast Brewing beer and Breakout Stout made with Marin Brewing beer. The CheeseQuake! shop also offers a drinkable CheeseQuake Shake and will soon sell Tremors, cookies made with cream cheese and butter, rolled in graham crackers. 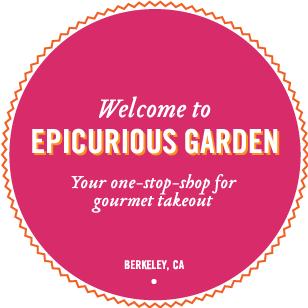 CheeseQuakes!, at the Epicurious Garden, 1511 Shattuck Ave. (at Vine), Berkeley. * Find the article here.